So what is a better subject for and younger viewer oriented cartoon than nuclear physics? We get to investigate fusion, fission, unstable elements, and maybe covalent bonds. The question remains whether all of this subject matter can be combined in an entertaining way, or will the half life of my attention span decay before making it to the end of the episode. Read on to find out. The teaser is about a game show hosted by the Riddler, asking riddles (would you expect anything else?) of not so bright bulb, Booster Gold, with Batman’s fate hanging in the balance. Let’s just say that Booster’s performance is less than admirable and Bats has to free himself in order to save the day. Too bad Skeets wasn’t allowed to help Booster, because if he had, I’m sure our heroes would have fared better. The story proper begins with a high school class touring a nuclear power plant. We are treated to a reversal of roles of sorts when we see a bright pupil enjoying the information, while his teacher (and also the school’s football coach) is quite bored by the ordeal. The group is startled when Doctor Double X shows up to commit some sort of ill defined crime at the facility. In the comics, this villain is a scientist named Dr. Simon Ecks (see what they did there?) who creates an energy duplicate of himself, going insane in the process. Here on the show that don’t dive too deeply into what he is, but they do show him being “two people”, a nice contrast to our eventual guest hero in this story. Batman shows up to battle the Badguy, and in the ensuing fracas an energy discharge fuses the unsophisticated high school teacher with his precocious pupil into a single body, that also has fiery hair. If you haven’t figured it out yet, it’s Firestorm. This is an interesting reimagination of the character, where originally it was an older nuclear physicist fused with a younger jock. I guess this reversal of roles serves to pander a bit to the intended audience, and I admit that Iam guilty of liking this twist. 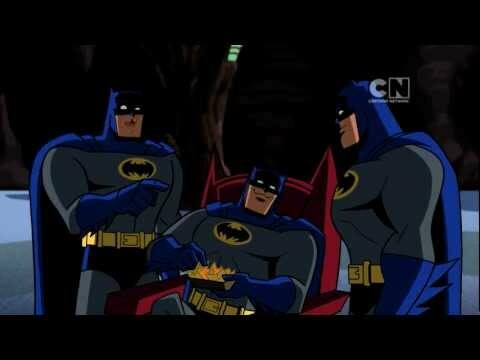 Also, unbeknownst to all but the viewer, Batman has been split into three parts: A logical/ empirical persona, and aggressive/ violent persona and a laid-back / stoner persona (complete with munchies). I felt like the stoner Batman was the most fun of the trio, but also had difficulty believing that there was even a single iota of this trait in Batman’s unified personality. So let me summarize what we have so far: a villain who is one person split into two, a new hero that is two people fused into one (complete with burning hair) and a hero split into three parts (one of whom is possibly Seth Rogen). This is nuts, but not as confusing as one would think, and a nice departure of the usual story material. Firestorm gets a suit and (eventually) a name, Batman fuses his parts back together, and Doctor Double X gets stopped. The details of how they do it all are sort of vague, but that’s ok because the humor and action make up for it. 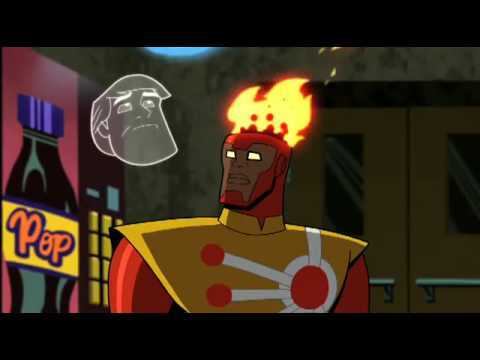 The best thing this episode has going for it is the introduction of Firestorm to the Brave and the Bold Universe, because honestly he is a super cool character (is that an inverted pun or irony – not sure) that tons of people enjoy, and the writers were able to give him a creative twist without compromising the core of the character that draws me too him. 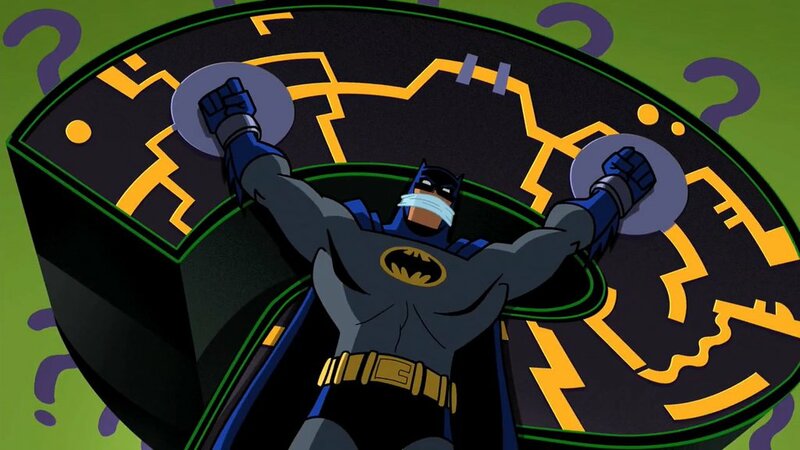 The Scooby Snack craving Batman, and well as the head cracking Batman were also a lot of fun, but the “logical” Batman just seemed like Batman. At one point I thought maybe Diedrich Bater was mimicking an Adam West intonation for the logical character, but that quickly faded. I think it would have been better if that had stuck around. Overall I think this is one of the more enjoyable episodes in the series, and I would easily place it in the top third of those I have watched so far, so if you have the time why not check this one out. I haven’t had time to read these for a while, but this seems like a fun one and an interesting take on Firestorm who I enjoy so far on the Flash TV show.